Buckle up. This is a long one. A tale of gorgeous stalks and eggy woe. Could it be more British or more attractive? The only vegetable we eat with custard. Forced Rhubarb (or woo-barb as we tend to call it in this kitchen), grown only in the Yorkshire triangle, has the same protected name status (PDO) as Champagne, Parma Ham and Stilton. Unfeasibly pink and almost iridescent, Rhubarb, like yellow peppers and star fruit, looks almost manufactured. And in a way it is. It's grown in artificial darkness; harvested by candlelight, to ensure no greening photosynthesis and a sweeter stem. Apparently you can hear it growing. I've been waiting all winter to produce a dessert to celebrate this only-in-the-UK delicacy. Traditionally served with custard (because even this tender variety needs sugar) these classic flavours were immortalised in my childhood chews. The main concern is one of texture. Like the mercurial ripeness of the fruit bowl pear, Rhubarb is not tender... until it suddenly is... and then it falls apart into an unlovely stringy mouthful. You can, of course, pulverise it to make a crumble or a tart but I wanted to maintain its integrity and make a display. 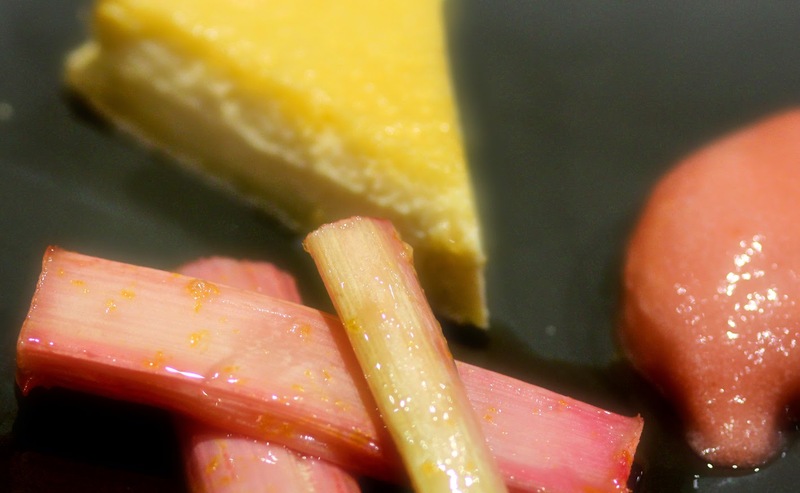 Orange baked rhubarb and rhubarb sorbet with custard tart. The colours are real. I also knew I didn't want to just coat it in custard; all too soft. I opted for another UK classic: the custard tart. Marcus Wareing's was often praised in reviews so I tried that. And boy, was it hard work. I'm still not happy. The tart I served this weekend (the one above) was my fourth and was certainly delicious but I hope, not my best. But back to the stiff, pink stuff. I experimented with traditional poaching and, of course, playing with the new sous vide machine but I didn't get the results I wanted. I came across this Xanthe Clay recipe where he bakes it in a cool oven. Cut the rhubarb into equal lengths. Split any very thick pieces laterally so they all cook evenly. Stack the stems together, dredged with 120g of caster sugar, and bake for 15 minutes in a moderate oven of 140 - 160°C. Remove and allow the rhubarb to soften; perhaps another ten minutes. As it does, it will absorb the sugar and ooze a delicious syrup. So simple. The one change I made, but it's an important one that I;m rather proud of, was to blitz the sugar with the zest of an orange. A citrus lift to a new flavour level. Just gorgeous. That syrup can be used to dress the dessert and/or stored away to pour on other things. I've already covered this here but since then I've read that Glynn Purnell poaches his rhubarb in cranberry juice, I presume for the colour. I can't be doing with that. Rhubarb is tart enough already and I want to keep the flavour pure. When I am faced with greenish,outdoor grown stalks, I add some grenadine. So to the tart. Such a simple thing: egg yolks whipped with sugar and cream, baked in a sweet pastry case. So why did it cause me so many problems? Which means vigilance in the kitchen. And a recipe that just can't be correct. Much like the rhubarb, custard tart is all about the moment. The French use the term 'à point': at the point of perfection, be it fish or steak or custard. When a ten seconds more or less would result in a worse outcome. This is the Wareing tart recipe. I don't use his pastry, I used my normal Roux pâte sucrée. This makes enough for two 8" tarts. I thought I would rather than risk disaster with one. By hand or by processor blend 250g plain flour, 100g icing sugar, sifted and pinch of salt with 100g butter, cubed until it resembles fine breadcrumbs. Gradually mix in 2 eggs, beaten. When the mix comes together, gather into a ball and knead a few times until it is smooth. Wrap in cling film and refrigerate for two hours. if you don't relax the dough your pastry will shrink. You don't want this. Pâte sucrée is usually easy to work but it helps a lot if it's chilled. Marcus adds the zest of a lemon to his. I added the seeds of one vanilla pod. 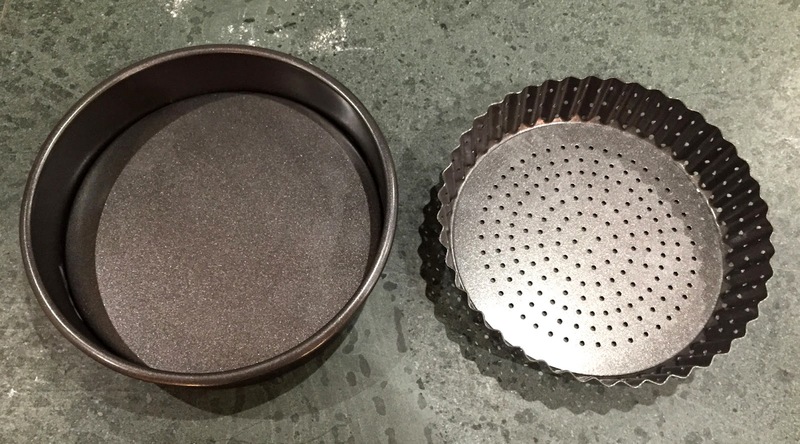 Once relaxed, split the dough and roll out half to the thickness of a pound coin, until it's a few inches bigger than your tin. I do this on a piece of floured baking paper as it makes it much easier to transfer to the tin and manipulate. Now drape the pastry over the tin and gently ease it up to allow it to drop to the bottom of the tin. Don't squidge it in, it will thin and tear. Carefully push the pastry into the corners and leave a good overhang. Repair any holes with additional pastry. Place the tin in the fridge for another half hour. I bought two new tins as my old 8" were nasty, thin affairs. While browsing I saw this new idea, full of holes to ensure a crisper base. Does it work. Yes. I thought I'd taken a pic of the cases but I'm buggered if I can find it. Here's the new, naked tins instead. Line the cold pastry with greaseproof paper or foil and bake blind with beans or rice for... well, now there's the issue. How long? Marcus says 10 minutes at 170°C. This cannot be right. He asks for golden but after ten minutes the tart is the colour (and probably the texture) of a pallid Goth, just emerged from a curtain drawn week of truculent introspection and Nine Inch Nails. It's TOO PALE Marcus. Worse, there's no snap This is all sog. This is especially true when you consider the subsequent filling is only baked at 130°C. No colour there. When you look at pictures of the end result, the Wareing pud is a deep biscuit brown. I'd recommend baking blind for 15 minutes at 180°C and the returning the shell for another 10 minutes. Obviously I'm wary of over-ruling multi Michelin starred Marcus but I can only think this is a transcription error. That or chef has deliberately kiboshed the recipe! He's quite the competive soul apparently. Whatever you do, I find it easier to trim the pastry overhang after the blind bake while things are still pliable. Just run your sharpest knife around the top of the tin. Bring 500ml of whipping cream to the boil. Beat (don't whisk) 9 egg yolks with 75g caster sugar until pale. Pour the hot cream onto the egg mix, beating as you do. Mix well. Pass through a fine sieve into a jug. Place the tart case on a baking tray in the oven. Fill with the mix. Pop any big bubbles on the surface. Bake for 30 - 40 mins at 130°C until just set. And right there, between 30 and 40 is a world of anguish. For my first tart, I checked at 30 and found a golden pond. I removed it at 40 when it was still wobbling. But it never set. I had to spoon out a top layer of liquid. This filling seems to set from the bottom up. Why would that be? My second tart domed for some reason and then the filling seemed to collapse. This is a known problem with custard tarts. Well, known now! It doesn't look bad in this photo but that's only half its original height. I removed it after 42 minutes and it set, but slightly too hard. Tart number two. Edible fail. Tarts three and four didn't dome and seemed well behaved but after 40 minutes still seemed very liquid. I timed another five minutes and they'd set - too much. All or nothing! By 'too much', I don't mean rubbery but they lacked that essential judder. There was a tad too much granularity My children call me too fussy but I know what I'm after and this wasn't quite it. I think I will have to check every minute after 38. I was still very pleased with the final combination of tart, baked rhubarb and a spoonful of sorbet on a bed of crystallised pecans. I got back only empty plates and it ate well, as chefs say. Begging the question: what else would you do with it? I'll report back on tart five, hopefully with a decent shot of the whole dessert. Of course, four yolky tarts down, I find myself with 36 egg whites. So first I have some meringues to make... and maybe a friand. If you ever revisit this, here's a few tips. His instructions for the pastry are indeed truly ridiculous. I blind bake for around twenty minutes at 190C until the pastry is set, remove the beans, turn the oven down to 160ish and cook until nice and brown - sometimes another 20 minutes or so. It doesn't matter if the edges look too browned/burnt as that'll be trimmed away later. Don't bother brushing the case with egg yolk, it doesn't make much difference and just leaves an unsightly layer on the base. An alternative way to make the custard is to whisk together the yolks and sugar then stir in the cream until combined. Pass through a fine sieve into a heatproof bowl and leave to settle for a few minutes. Remove as much froth as possible with a spoon or kitchen towel. Set the bowl over a pan of simmering water and warm the mixture - Marcus says to blood temperature (37C) but I take it to around 55C (but no more than 60C), stirring constantly. Fill the tart with the warmed cream and grate LOADS of nutmeg on top (up to a whole seed if you like). Bake at 100-110C for as long as it takes. Don't obsess with the time - it's done when it's done. Might be 30 minutes, might be 45 or an hour. Judge it by eye with the wobble test. (It's important to do it low and slow. Some of your issues seem temperature related so it might be worth spending a few quid on an oven thermometer if you don't have one.) Leave to cool before trimming away the pastry for clean edges. Having said all that, I think it's an overrated tart, pleasant but nothing particularly special. Dunno why it's garnered such adulation. Fantastically full comment Pete. Thanks. I've no plans to return to custard tart days. As you say: it doesn't seem worth the effort. A lemon tart is simpler and so much tastier. I have a very good oven and I have an oven thermometer. Never quite sure why the same recipe in the same oven should vary by 30%.